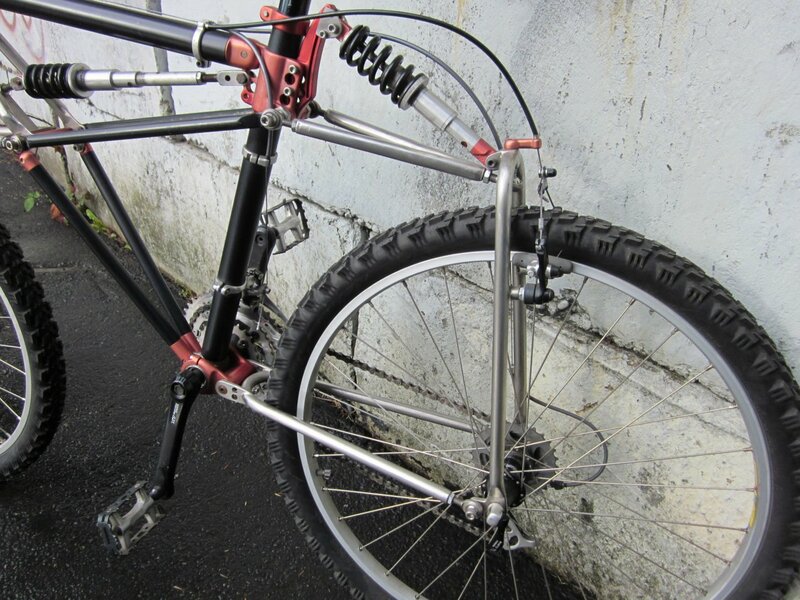 I have almost completed the building of my first bicycle – 1987 fully suspended, an abstract design without a precedent. Before it ever hit the road I had to concede that while the design was far out it was also far off. Have kept most of its parts though. 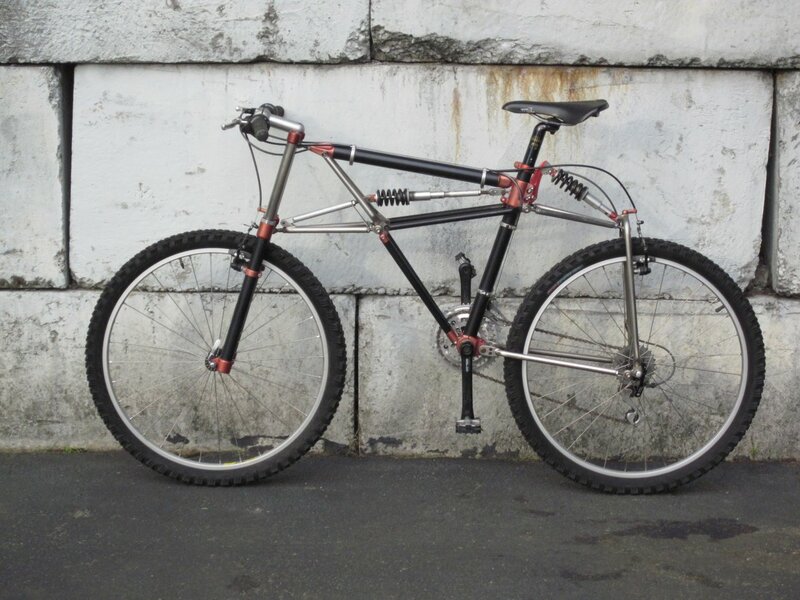 Completed the second – 1991 also a fully suspended bicycle a combination of a discarded conventional diamond frame, a commercial suspended fork and a rear suspension of my own design. Have ridden it around a parking lot a few times while others took it out on the road. It was rather uninspiring and except for a few photographs I no longer have it. 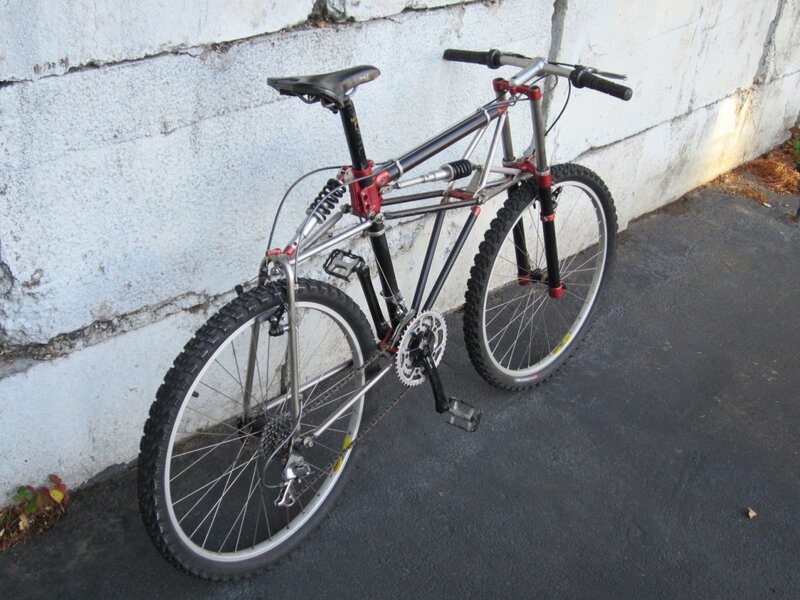 Still have the third – 1993 fully suspended bicycle. Once again built to an abstract design it worked very well although the steering was awkward. With a development it would make a true niche product. 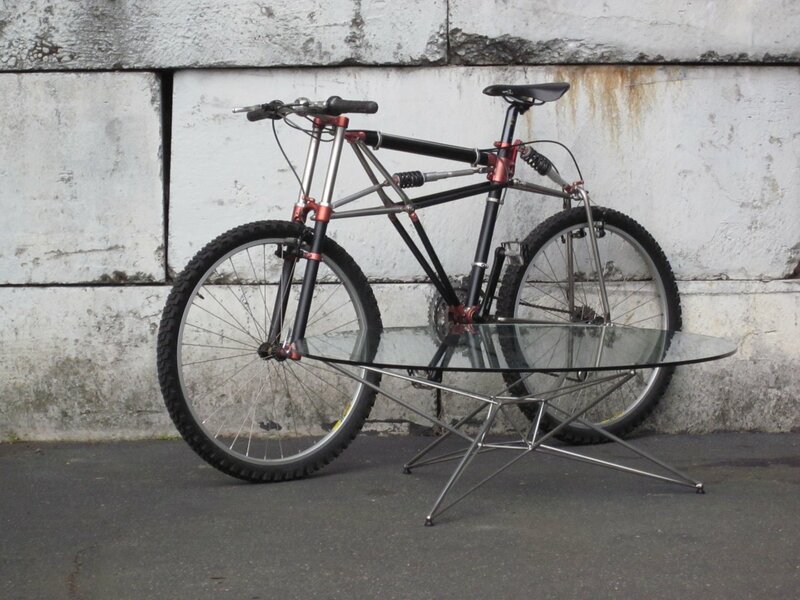 In 1994 – 1995 I have conceived, designed and built my fourth and the last fully suspended bicycle. By then I have began to be conscious that creating a concept, following up with a design and a realization of it is a process of understanding. Understanding of my self. 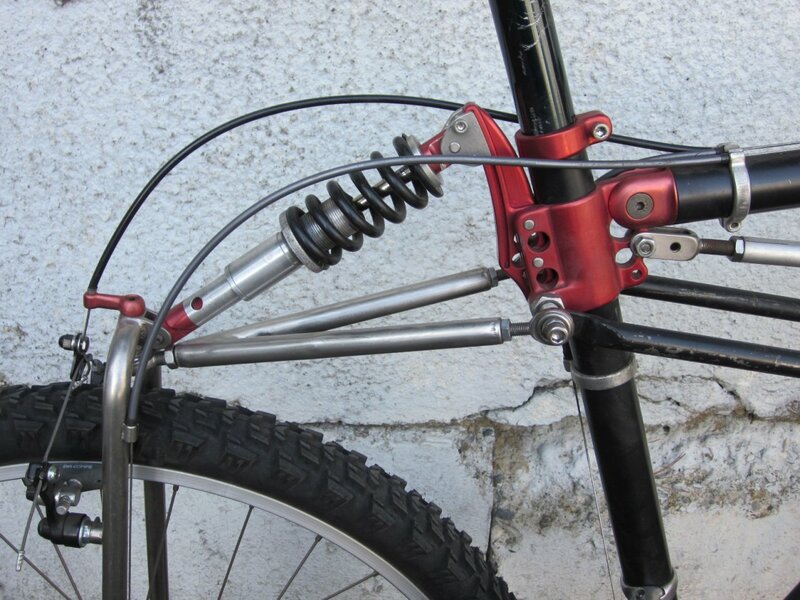 The front suspension of the 1995 bicycle is of a “telelever” type a term coined by BMW for the front suspension employed in some of their motorcycles. 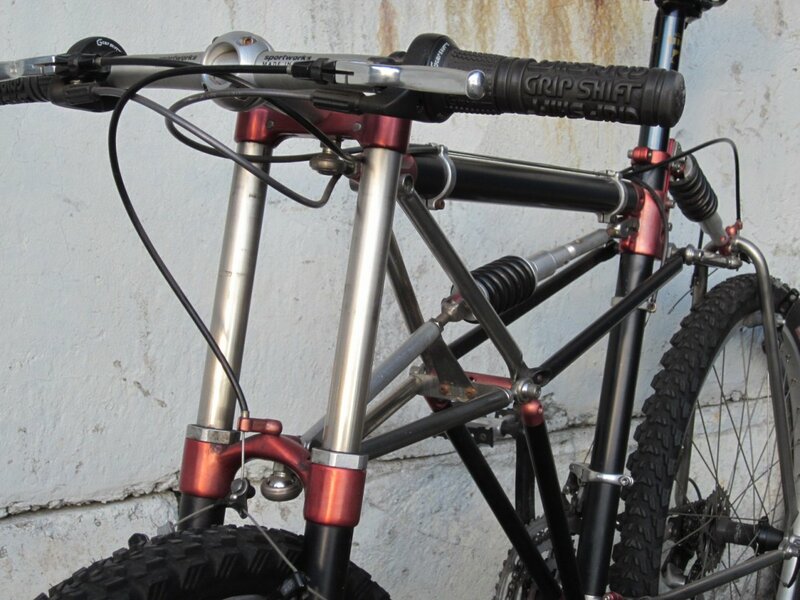 I have learned about that type of suspension in 1993 while reading an article in February issue of Super Bike magazine saying (not per verbatim)…..that type of suspension was conceived and designed by Nigel Hill of Saxon engineering and the team Motodd employed and raced it in their motorcycles some years before BMW came out with it….. and have adapted it for my bicycle. As it stands the front suspension has about 6.5 inches of travel and is adjustable for a rake, trail, ride height, spring rate and dive/anti-dive. 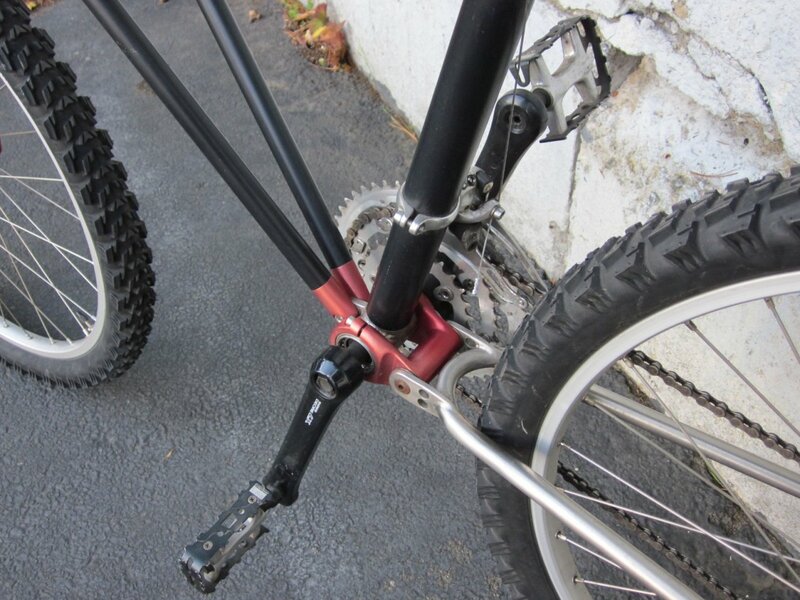 The rear suspension has also about 6.5 inches of travel, is of a parallelogram type and is adjustable for a ride height and a spring rate while the swing arm pivot is height adjustable to control the amount of squat under pedaling. 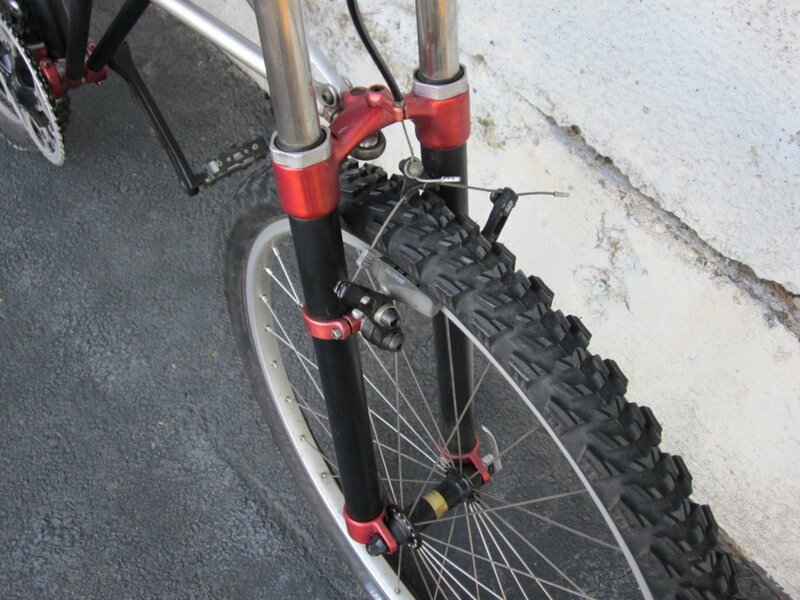 The coil over shocks that I have modified and the obviously standard bicycle components are of 1991 -1995 vintage. A space frame of my own design ties it all together. 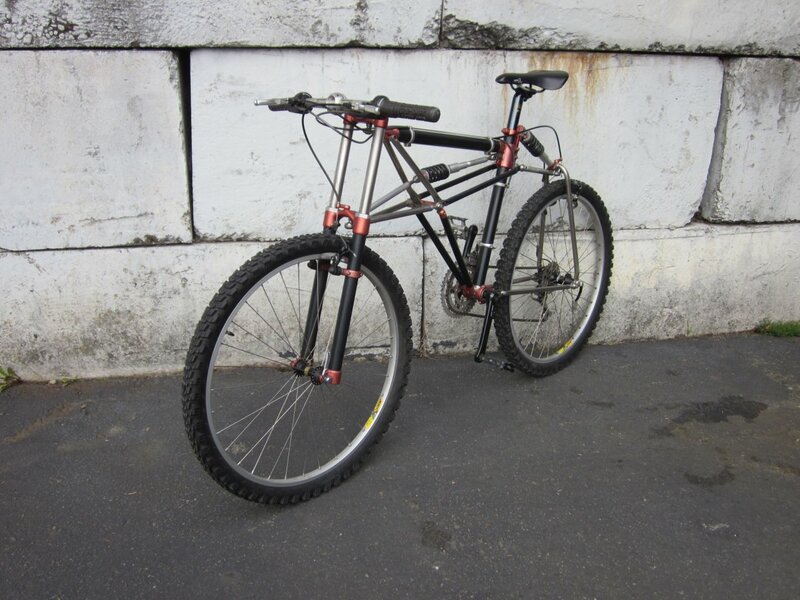 The complete bicycle weighs 28 pounds. 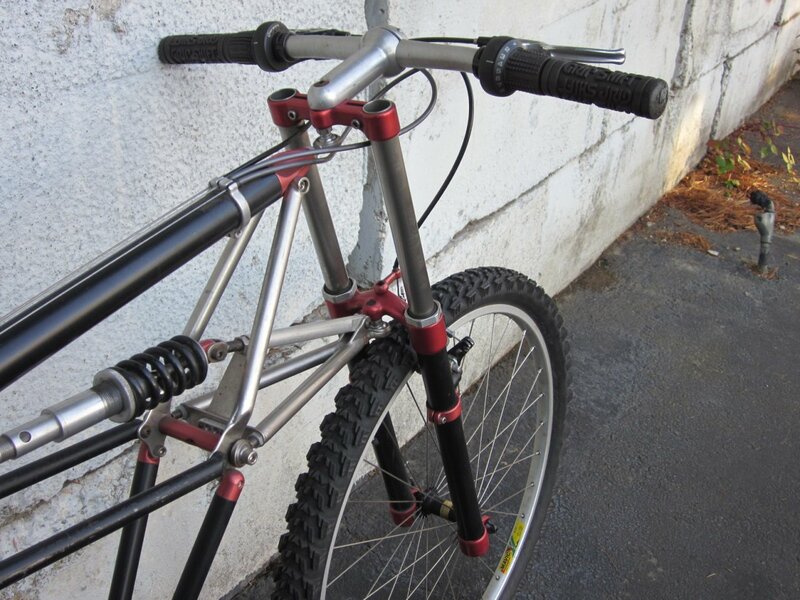 The individual parts, weldments and bonded sub assemblies are made of various materials, primarily metals and are bolted together to form the bicycle. I have resolved to use this type of construction to be able to readily change the dimensions, alter the geometry, use dissimilar materials, to explore the feasibility of that type of construction for production and because I love to push the envelope and wanted to see it build! I have made all the parts myself. Most of them on a manual universal mil and by hand, a few on a lathe. 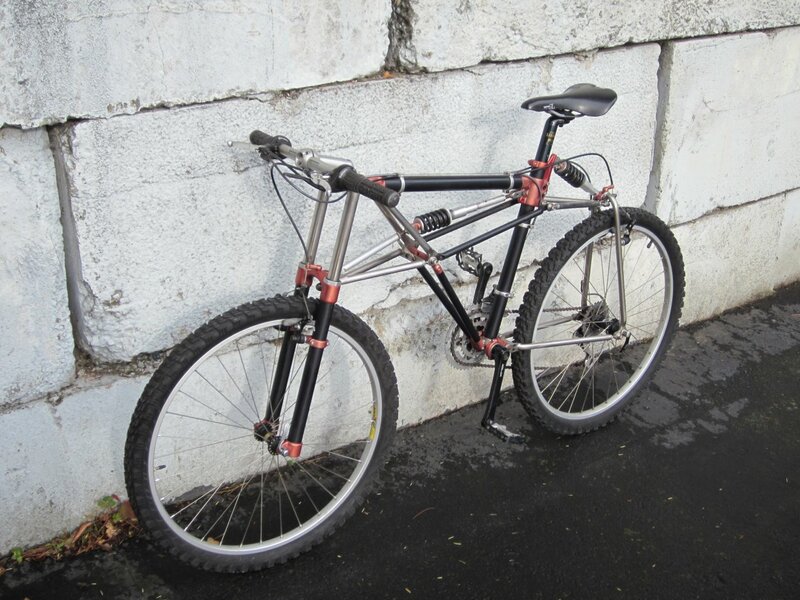 The design and the realization of the 1995 bicycle reflects my abilities, knowledge and the state of mind I was in at that time. The bicycle works as intended and the few changes I have made to see “what if” have brought no improvements thus everything is back to where it was the day I have finished it the first time. The concept stands. I see it as timeless. Although I have spent many years in the employment of several companies working as a fabricator, toolmaker and tool designer, building prototypes, participated in a product design and development, for most of my working life I have been self employed – one man shop – doing the same as when employed by others and building my own product in addition. Above all I have been pursuing my passion – projects such as the bicycle, varied in a scale and a state of completion – hundreds of them and counting. The ever expanding sphere of my projects and interests includes – industrial design, housing, transportation, furniture, tooling, energy…….. I don’t even ride bicycles. I walk.